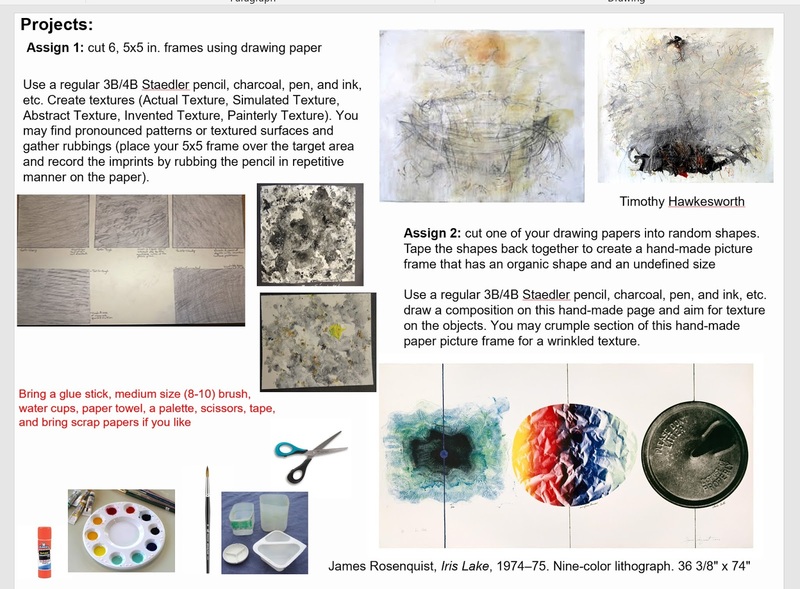 Bring the two objects you used to draw your 3 drawing pieces on Wed 9/19, for the critique we will have on 9/24 to show along side your drawings. 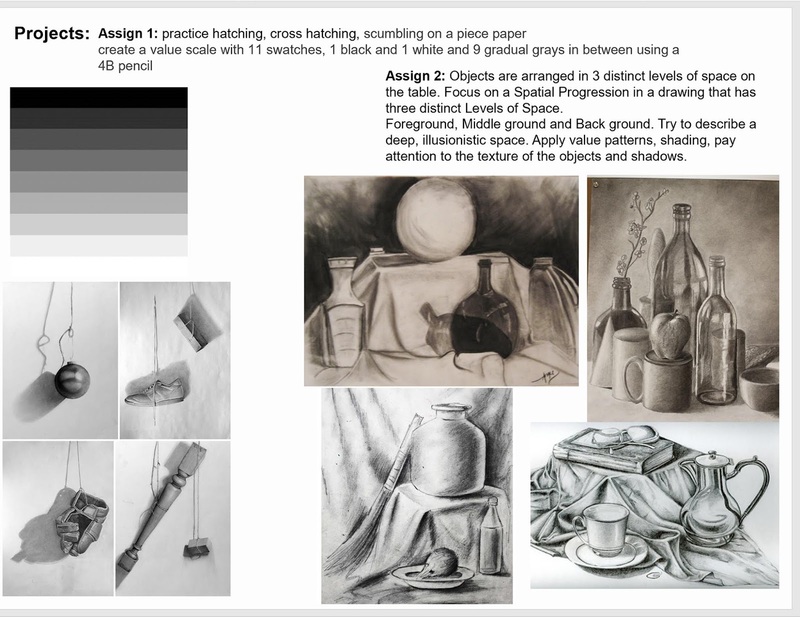 Create 2 drawing-compositions with your objects, you may use 2 other objects of your choice from classroom's still life collection. Drawing 2. Draw object 2. (whichever object you choose between the two), use shapes, positive/negative spaces. You must cut your frames and use drawing paper. 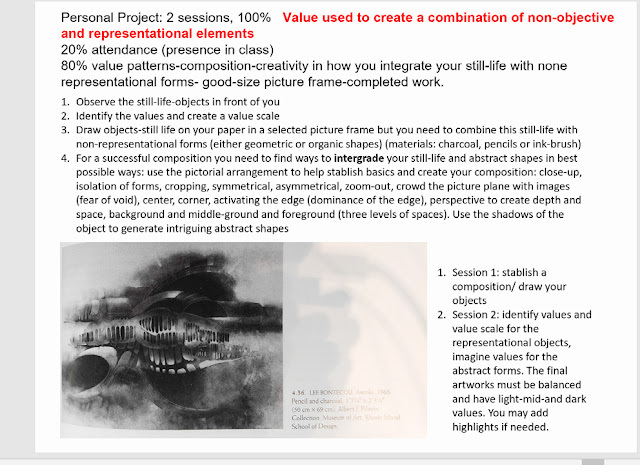 Drawing 3. present the two objects together in an elaborate composition. You may use text, or another object or more objects to compose with your 2 objects. The aim with this exercise is to create a cohesive, emotional drawing that presents some sort of content/intention. Use compositional techniques in your composition, use perspective. 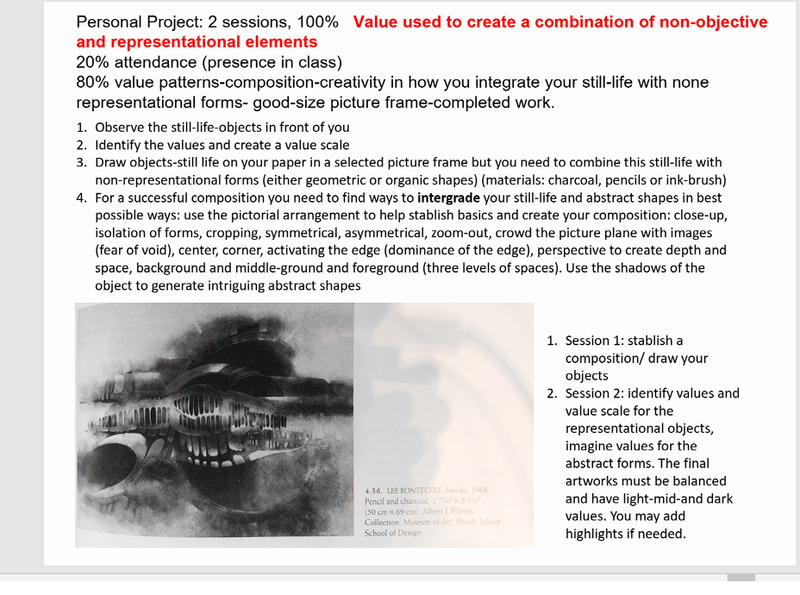 Project your feelings on your objects and compositions. Use thin, thick and all other sorts of lines. You must cut your frame and use drawing paper. Materials: pencils on paper or charcoal pencil. These will be critiqued on Monday 24th. Final Assignment Due Date: Mon. 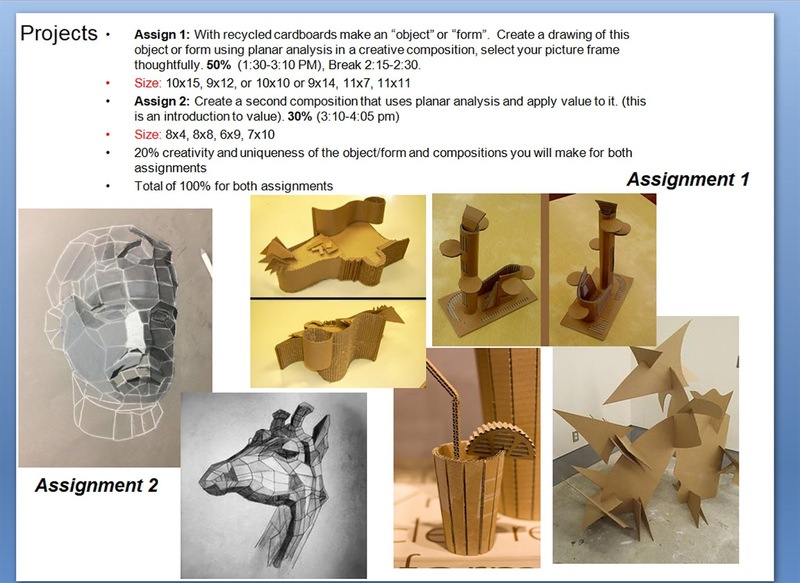 Oct. 8th (you have 11 days to finish this assignment). Library Visit: you will meet with either Michelle Morton or Laura Dickie at Library’s classroom upstairs inside the library at 1:40 PM. One of the Librarians will conduct a lecture from 1:45 to 2:15 PM on how to research online and the library database. After the lecture you will have time until 4:00 PM in the classroom to research online or use the library and find your artists (you have access to computers inside the classroom). Librarians have Art 2A roster and will take roll. Please be on time! free black & white printing in the classroom is OK, but for color printing students would have to come downstairs to print. The cost is 50¢ a page. · Research 2 artists (one from the past and one from contemporary/recent time). See the list below. You may choose only 1 artist of your choice as long as they are well-known. Answer the following questions: Who made the artworks, where they are from and what are interesting about the artists? 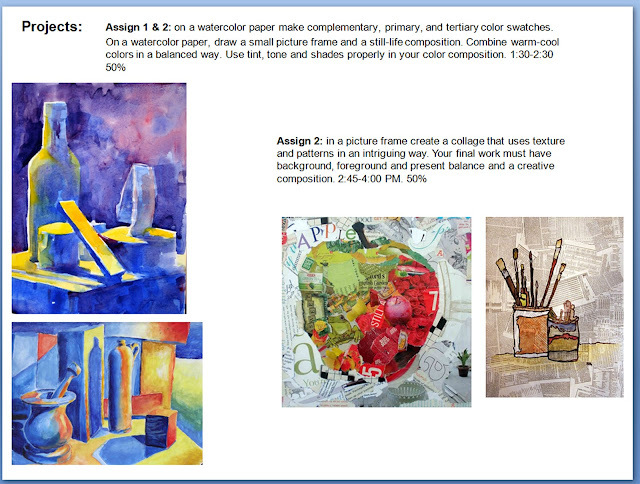 (specify 1-3 characteristics about the artists or their process that are attractive to you). What are the medium (media), dimensions, and date the arts were created? What are the artworks about? Explain the inspiration/s behind each work? How are the artworks relevant to you as an artist? "PLEASE TELL YOUR STUDENTS TO CHECK THEIR LOCKERS! I have put notices on all lockers that are not labeled with an instructor's name and the current semester. Locks will be cut from lockers without current labels on Friday, 9/21. If there is a notice that their lock will be cut, please ask them to label the locker with their instructor's name and the current semester, Fall 2018. This will save work for students and the department. The deadline for clear labeling of the lockers is Friday, 9/21.